Our guides were delightful company. They were knowledgeable about the history and geology of the Grand Canyon, and they added a lot to the pleasure of the trip. 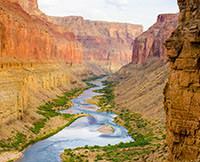 The river and the Grand Canyon cannot be experienced in a better way than to take this trip.